Heat oil in non-stick pan , add cumin seeds , hing , garlic , green chilli and sauté . add chopped radish , salt , turmeric powder and mix well . cook for 1 to 2 minutes . Add radish leaves, red chilli powder , coriander powder and mix well . add besan and mix well . Sprinkle 2 to 3 tablespoons water and cover it for 3 to 4 minutes or till cook . 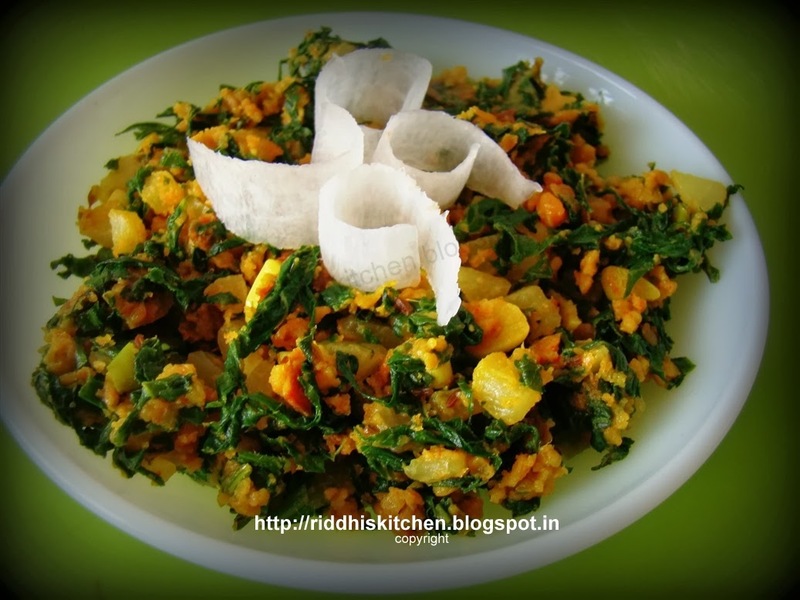 Garnish with radish strips and serve hot with roti . A very good recipe.. I just pre-cooked the radish separately initially. Tried it out and it came out well :) Thank you! Thank you for your lovely comment. I am happy that you like "Mooli Masala". Try more and more recipes and give me feedback. once again thank you so much:). Keep cooking.